The Unix operating system is a set of programs that act as a link between the computer and the user. The computer programs that allocate the system resources and coordinate all the details of the computer’s internals is called the operating system or the kernel. 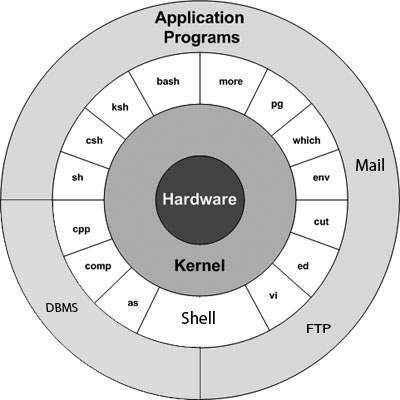 Users communicate with the kernel through a program known as the shell. The shell is a command line interpreter; it translates commands entered by the user and converts them into a language that is understood by the kernel. Unix was originally developed in 1969 by a group of AT&T employees Ken Thompson, Dennis Ritchie, Douglas McIlroy, and Joe Ossanna at Bell Labs. There are various Unix variants available in the market. Solaris Unix, AIX, HP Unix and BSD are a few examples. Linux is also a flavor of Unix which is freely available. Several people can use a Unix computer at the same time; hence Unix is called a multiuser system. Kernel − The kernel is the heart of the operating system. It interacts with the hardware and most of the tasks like memory management, task scheduling and file management. Shell − The shell is the utility that processes your requests. When you type in a command at your terminal, the shell interprets the command and calls the program that you want. The shell uses standard syntax for all commands. C Shell, Bourne Shell and Korn Shell are the most famous shells which are available with most of the Unix variants. Commands and Utilities − There are various commands and utilities which you can make use of in your day to day activities. cp, mv, cat and grep, etc. are few examples of commands and utilities. There are over 250 standard commands plus numerous others provided through 3rd party software. All the commands come along with various options. Files and Directories − All the data of Unix is organized into files. All files are then organized into directories. These directories are further organized into a tree-like structure called the filesystem. If you have a computer which has the Unix operating system installed in it, then you simply need to turn on the system to make it live. As soon as you turn on the system, it starts booting up and finally it prompts you to log into the system, which is an activity to log into the system and use it for your day-to-day activities. Have your userid (user identification) and password ready. Contact your system administrator if you don’t have these yet. Type your userid at the login prompt, then press ENTER. Your userid is case-sensitive, so be sure you type it exactly as your system administrator has instructed. Type your password at the password prompt, then press ENTER. Your password is also case-sensitive. If you provide the correct userid and password, then you will be allowed to enter into the system. Read the information and messages that comes up on the screen, which is as follows. Step 1 − To start, type password at the command prompt as shown below. Step 2 − Enter your old password, the one you’re currently using. Step 3 − Type in your new password. Always keep your password complex enough so that nobody can guess it. But make sure, you remember it. Step 4 − You must verify the password by typing it again. Note − We have added asterisk (*) here just to show the location where you need to enter the current and new passwords otherwise at your system. It does not show you any character when you type. You can use the ls command to list out all the files or directories available in a directory. Following is the example of using ls command with -l option. Here entries starting with d….. represent directories. For example, uml, univ and urlspedia are directories and rest of the entries are files. While you’re logged into the system, you might be willing to know : Who am I? Try it on your system. This command lists the account name associated with the current login. You can try who am i command as well to get information about yourself. Sometime you might be interested to know who is logged in to the computer at the same time. There are three commands available to get you this information, based on how much you wish to know about the other users: users, who, and w.
Try the w command on your system to check the output. This lists down information associated with the users logged in the system. When you finish your session, you need to log out of the system. This is to ensure that nobody else accesses your files. Just type the logout command at the command prompt, and the system will clean up everything and break the connection. You typically need to be the super user or root (the most privileged account on a Unix system) to shut down the system. However, on some standalone or personally-owned Unix boxes, an administrative user and sometimes regular users can do so.